Item #IGM-S3032612002: Approximately 2 3/4" tall pair of Cloisonne peach boxes with a 3/4" tall wooden stands. Floral pattern with assorted background colors. 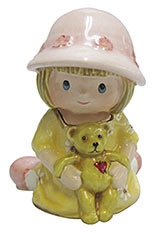 Item #IGM-12049: Approximately 2 3/4" tall, Bijorca Enameled Baby Girl with Teddy Bear Box; Magnetic lid. 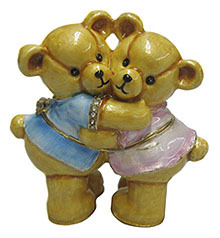 Item #IGM-12046: Approximately 2 3/4" tall, Bijorca Enameled Hugging Bears Box; Magnetic lid. 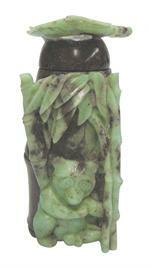 Item #GS-2140: 4.5" tall Chrysoprase and Matrix Bamboo Box with Panda. 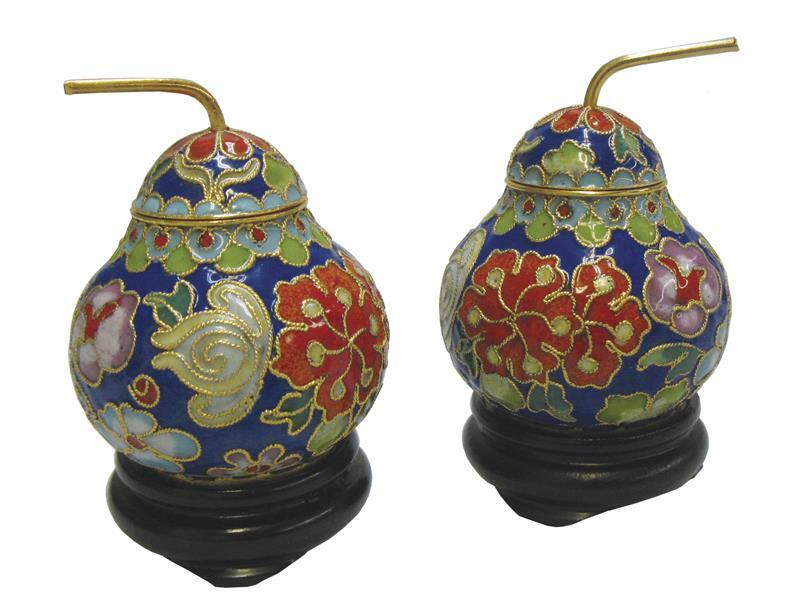 Item #IGM-S3032612014: Approximately 1 1/4" tall x 2 1/4" round Cloisonne box with floral design. Item #SY-161-1A: ESTATE PIECE - 1 3/4"x5/8"x1 5/8" Sterling Silver Floral Pill Box; 22.76 grams. Item #GNCB18: 2.875"x4.25"x"1.375" tall reconstructed Lapis Lazuli business card box with map of the world inlaid with colorful slabs of gemstones. Felt lined and removable lid. Item #IGM-LLBX-500: 5 3/8"x4" Afghanistan Lapis Lazuli octagonal box with circular lid inlaid on white marble for durability. Item #GS-286: 6.25"x4.25"x1.625" brown, green, peach, and tan pattern Leopard Skin Jasper box with black felt interior & bottom and hinged lid. Item #GS-287: 9"x6"x1.875" brown, green, peach and tan pattern Leopard Skin Jasper box with black felt interior & bottom and hinged lid. 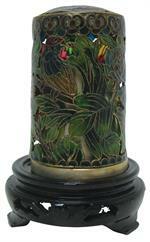 Item #MOPB-650: Assorted Natural Colors; 2 1/2 x 1 1/2" tall; Removable lid. 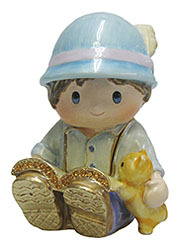 Item #RBM-500: White & Cream; 3 1/2 x 2" tall; Removable lid. Item #RBS-250: White; 2 1/2 x 1 1/2" tall; Removable lid. 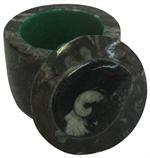 Item #AF-BX-S-18: 2 1/2" round small Ammonite Fossil box (Morocco) with removable lid. 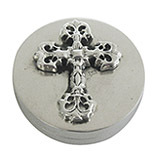 Item #ELY-0811-BX-188: 1 5/8" round Sterling Silver Hinged Box with Cross Design. 47.31 grams. 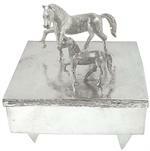 Item #SS-1141: 1.25x1.25" tall Sterling Silver Handbag Shape hinged Box of 27.59 grams. Item #SSB-TA-484: Sterling Silver Hinged Box with Turritella Agate Top of 233.73 grams T.W. Item #ELY-SSPB-84: 1.5x1" Round Sterling Silver Hinged Pill Box with +100 year old Chinese Coin Replica; 64.56 grams. 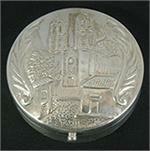 Item #SS-1371: 1 3/4" Round Sterling Silver Pill Hinged Box with Palace Scene of 39.87 grams T.W. Item #SS-1415: 2" x 1" x 7/8" tall Sterling Silver Woven Design Pill Box of 47.91 grams.